In the blogging world, it's not unusual to have friends that you've never met in person. There's only a couple of blogging friends that I can say that I've met in real life and that I keep up with socially as well as in the blogging world. KC from The Real Thing with the Coake Family is one of those elite. We met a couple of years ago at a blogging conference and bonded over being crafty girls and being a girl mom! We also happen to have a mutual acquaintance – a girl who was in my (very small) class at architecture school! 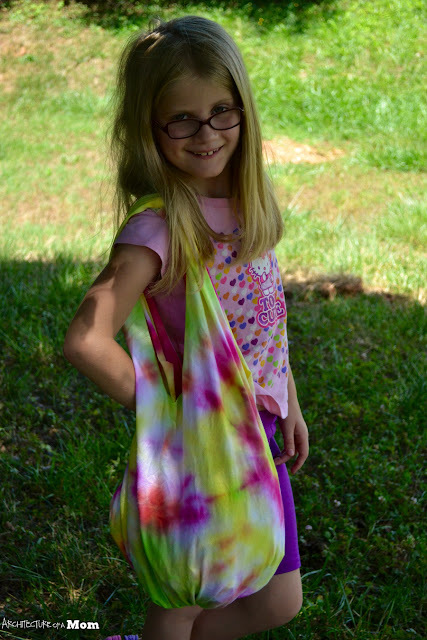 I'm super excited to share how to make a no-sew tie dye tote over at her blog this morning! It's the perfect bag to make with your kids, and it's the perfect washable tote to go to the pool, park, or beach this summer! Welcome to my little corner of the internet. I hope you'll stay a while!